What are some common features of Maya cities? What was the purpose of a Maya stelae? Compare and contrast the Maya city of Uxmal to your own city or town. Maya Cities served the specialized roles of administration, commerce, manufacturing and religion that characterize ancient cities worldwide. Cities tended to be located in places that controlled trade routes or that could supply essential products. This allowed the elites that controlled trade to increase their wealth and status. Such cities were able to construct temples for public ceremonies, thus attracting further inhabitants to the city. Those cities that had favorable conditions for food production, combined with access to trade routes, were likely to develop into the capital cities of early Maya states. In contrast to the Aztec or the Inca – or for that matter, the ancient Romans – there was no single Maya empire. The political relationship between Classic Maya city-states has been likened to the relationships between city-states in Classical Greece and Renaissance Italy. Some cities were linked to each other by straight limestone causeways, known as sacbeob, although whether the exact function of these roads was commercial, political or religious has not been determined. Maya cities usually had a ceremonial and administrative center surrounded by a vast irregular sprawl of residential complexes. The centers of all Maya cities featured sacred precincts, sometimes separated from nearby residential areas by walls. These precincts contained pyramid temples, large thrones that were essentially pyramids from which kings could survey their domain, and other monumental architecture dedicated to elite activities such as stelae – essentially stone billboards raised to glorify the king and record his deeds. Most Maya stelae and temples were probably brightly painted in red, yellow, black, blue and other colors. City centers also featured plazas, sacred ballcourts, and buildings used for marketplaces and schools. Most Maya cities tended to grow outwards from the core, and upwards as new structures were superimposed upon preceding architecture. With the exception of their central cores and in contrast to other Mesoamerican cultures (like Teotihuican or the Mexica), Maya cities show little evidence of formal planning and were subject to irregular expansion, with the haphazard addition of palaces, temples and other buildings. The ceremonial center at Uxmal, one of the better preserved of the large Maya cities, located in modern Mexico. What were the primary construction materials used in Maya ceremonial centers? In the homes of commoners? What limited the height and interior dimensions of rooms with stone roofs? Why didn’t the Maya use animals like oxen or horses to transport building materials for their great construction projects? Throughout their history, the Maya built their cities with Neolithic technology using no metal tools; using both perishable materials and from stone. The exact type of stone used varied according to locally available resources, but across a broad swathe of the Maya area, this meant limestone was the main medium of construction for the most impressive Maya structures. In the Yucatan, the local limestone is relatively soft when freshly cut, but hardens with exposure. Limestone was burned at high temperatures in order to manufacture cement, plaster, and stucco. Lime-based cement was used to seal stonework in place, and stone blocks were fashioned using rope-and-water abrasion (a rope dragged back and forth like a saw), and with obsidian tools. The Maya did not employ a functional wheel and in any event, there were no pack animals in Pre-Columbian America capable of helping humans to move large burdens, so all loads were transported on litters, barges, or rolled on logs. Heavy loads were lifted with rope, but probably without employing pulleys. This Maya man in modern Guatemala carries his burden much as his ancestors must have while constructing the great pyramids and temples of their ceremonial centers. Basic structure of a corbel arch employed throughout the Maya world. The weight of the stone at the top pushes outward on the middle portions of the structure, requiring stone supports outside of the arch to keep it from collapsing. Stone roofs and doorways were created using the corbel arch – constructed by offsetting successive courses of stone so that they project towards the archway’s center from each supporting side, until the courses meet at the apex of the archway (often, the last gap is bridged with a flat stone). Corbel arches and vaults require significantly thickened walls and an abutment of other stone or fill to counteract the effects of gravity, which otherwise would tend to collapse each side of the archway inwards – meaning that the interior spaces of Maya temples and pyramids tended to be fairly small. Wood was used for beams, and for lintels, even in masonry structures. Throughout Maya history, common huts were built from wooden poles and thatch. What were the basic rules of the ballgame? Why was the ballgame so important in the Maya world? What similar roles do sports play in your own culture? How are they different? 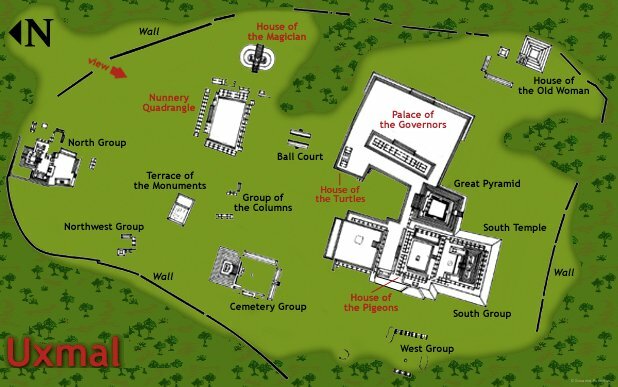 The ball court at Chichen Itza as it must have appeared some 1000 years ago. As an integral aspect of the Mesoamerican lifestyle, the courts for their ritual ballgame were constructed throughout the Maya realm, often on a grand scale. The playing alleys of ball courts were defined by two long walls. Courts built earlier in Maya history (as at Cobá) had sloped sides, while ones built later (as at Chichén Itzá) had vertical sides. Frequently, the ends were enclosed so as to create an -shaped court when viewed from above. The ball court itself was a focal point of Maya cities and symbolized the city’s wealth and power. When the Maya played games in the ball courts, the ball was made of solid rubber and was sometimes as much as a foot in diameter. It was passed between teams ranged on opposite ends of the court. The players could hit it only with their knees or hips, much like football or soccer today. Points could be scored when the opponents failed to return the ball correctly. Ballgame scene, from a ceramic Maya vase. team by propulsion by one of the above body parts. The aim was to move the ball back to the opposite team, preferably through the ring. The goal of the opposition (what today might be termed ‘the defense’) was to force the offense to lose control and to allow the ball to touch the ground. The stone ring was an innovation of the late-classic and early post-classic periods, as seen in Chichen Itza and in Uxmal. Playing the ball off the border wall could intensify the game. The ricochet of the ball could hardly be anticipated, especially if the walls were uneven. A player relies on hips and thighs to move the ball around the court. The Maya ball game originated more than 3,000 years ago. The Popol Vuh, a Maya epic in the vein of The Odyssey from Greece, describes a conflict of the forces of darkness and light. By tradition, the twin brothers, Hun Hunaphu and Xbalanque – the stars of the Popol Vuh, known sometimes as the Hero Twins – used their time on earth to play ball. The noise of their play aroused the anger of Vucub Came, the master of the underworld. A fight ensued, from which resulted the form of the ball game as the Maya played it. In the course of the contest, one of the brothers was decapitated and his head was used as the game ball. From the decapitated trunk of the player, blood escaped in the form of snakes. This blood was interpreted as a symbol of fertility. This scene is depicted in reliefs on the walls of the ball court at Chichen Itza, the largest playing field in the Americas at the time. The Maya ballgame was more than just an athletic event. It was also a sacrificial and religious event. The Maya believed that it was necessary to play the game for their own survival. The ballgame provided an opportunity to show devoutness to the gods by sacrificing captured kings and high lords, or the losing opponents of the game.